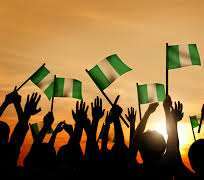 In order to solve Nigeria’s man-made problems, let every Nigerian start to think right away of what he or she can do to ensure the survival of our country, Nigeria. We need to look at ourselves and ask what we as individuals can do to bring about positive improvements in our environments. Let us not look for handouts, handouts of a bag of Salt and Rice or money for example, in exchange for your vote. The salt and Rice will not last long but voting for the right person or persons, those who you know can fast track or forward development of your community and could have a lifetime of positive effects on your community and subsequently on you and your families for a long time. If every Nigerian in the country is able to feed him or herself, the country is fed, therefore let everyone think of what he or she can do to better his or her own living condition and standard. We should look around our individual environments or communities with a view to identifying its needs. Then begin to look at positive solutions and opportunities that one can bring forth or participate in. Build on your own strengths, knowledge and skills to shape your own positive solutions. Consider for example micro enterprises that require little to no capital to start. Support may still be provided by government through, for example, enabling conditions, but don’t wait on it, take the lead and define your course of action. Use your initiative, be creative, form coops, utilize your Osusu which was the native way of savings before the modern banks and banking were introduced, and very importantly, follow through your course of action you have decided upon. Let every Nigerian have confidence in him or herself because it allows for serious thinking that leads to creative minds which is the key to new inventions. No Nigerian should wait for any hand-out. Let us explore new opportunities look for positive ways to help ourselves. Remember that the Good that you do follows you so make it a point to serve the needy and help your neighbours and other as you go. A true and successful democratic governance is one in whose Constitution encompasses the tenets of the people’s culture and traditions, in other words, a people’s government must recognize the powers and ideals of the culture of the land which that government belonged in order to succeed. No one democratic government can be a carbon copy any other democracy because each democracy recognizes the country it belongs. Therefore, the next administration should cause a review of Nigeria’s constitution. The Oath of Office in our land should be redesigned to negate the use of foreign religious tools; the tools and implements of our Oath of Office should be in accordance to our culture and tradition, and the Oath is conducted or administered by the appropriate Priesthood of the traditions. To instill discipline, sincerity and preserve our wealth for the use of all; our judicial officials including Judges, politicians, and public office holders must take the Oath as well. In order to turn a new leaf all together, the name Biafra should be adopted for our country. Niger River or area only from where Nigeria is derived is not enough to describe our people. i. The language of this area now called Nigeria was Songhai. For political wisdom and reason, this area, actually and appropriately should have been called Biafra which is derived from the Bight of Benin and Biafra. The Bight of Benin and Biafra River is what Mongo Park, a British Surgeon turned explorer had called River Niger, which our country was later named after. ii Historically and actually to this day, the Bight of Benin and Biafra River is called Osimhi (Osimhi no rtha Ame ne Eda, meaning the big river that supplies water to other smaller rivers), by the people of Ekphei in Etsako, Edo State. And the people of Ebu in Oshimili Local Government in Asaba Province of the Delta State of Nigeria call the Bight of Benin and Biafra River, Oshimilli. It was in Asaba Province, at Burgu in Bussa that Mongo Park drowned and died. I was in Standard 3 at St. Martin’s Catholic School in Ekphei in 1953 when I first learnt in my History class that Mongo Park discovered the source of the Niger and named it, River Niger. My question then and now was what of the people whose source of livelihood was the river before Mongo Park, and was Mongo Park not aware that the natives have a name, Osimhi and Oshimili, for the River? iii. Politically let shallow mindedness with weak emotion get rid of those who want to break away from the most populous and powerful nation in Africa. This suggestion is a potent political uppercut to the enemies of our people. Britain deceitfully tell-guided and took charge of arrangement that led to Independence on October 1, 1960. Otherwise, Biafra would have been our name instead of what Lord Lugard’s girl friend called us in ignorance of the history of our land and people. We are the only African nation, except South Africa, that has continued to bear and use the name the colonial authority gave to us. We need to be wise and patriotic. The Ghanaians changed their colonial name from Gold Coast to Ghana; The Kenyans from Zanzibar and Tanganyika to become Kenya; Ugandans from Buganda to Uganda, Ivory Coast became Cote d’ Ivaire; Congo to Zaire, to mention but these few. All of these countries are each smaller than our own country. Are we to say that the citizens of these smaller countries are more patriotic, wise and proud of their African heritages than we are? Most importantly, those millions who gave up their lives to ensure that we stay together and remain one country would have died in vain if we should allow division to keep us apart. Let us take on the name Biafra, to defeat those who want to keep us divided, and if only to demonstrate our wisdom, knowledge and understandings of our Founding Fathers. 6). Recognize the witches and wizards of our country in order to give everyone the opportunity to contribute what they know best for our country’s success; it will also allow the “people with spiritual knowledge” to play their own part towards the success of country and its people instead of using such knowledge to destroy without building. .7) Let us maintain the Secular nature of our country; foreign religious dogmas have affected our people negatively; a progressive people reserve the right to decontaminate the minds of their people. The Churches and Mosques with their activities in our country should call for a review for the sanity of our citizens. Religion is opium, a tranquilizer, and no sane nation would allow the minds of its citizens to be in an unthinking state of stupor forever. 8.) Bring our people and country’s History as a course of study back into our schools at all levels. Many young people born in our country from the 1980s do not know who were our Founding Father, Hubert Macaulay, The Rt. Hon. Nnamdi Azikiwe, Chief Obafemi Awolowo , Chief Adelabu (Kpeclemensi), Anthony Enahoro, Omo Osagie, Chief Denise Osadebe, Omo N’ Oba Ne Edo Uku Akpolokpolo Oba Akenzua, Chief Samuel Oladuke Akintola, the Ode of Ishara, Oni of Ife, Chief T. O. Benson, J. M. Johnson, Chief Okotie Eboh, The Sadauna of Sokoto, Alhaji Ahamadu Bello, A. C. Nwampa, Dr. E. M. L. Endeley, Mallam Aminu Kano, Mr. J. S. Tarka, Dr. M. I. Okpara, Dr. Chike Obi, Late Chief Bode Thomas and Chief H. O. Davis to mention but these few. Our children need to know our founding fathers. In music, our past, notable musicians, Victor Olaiya, Ayinde Bakare, Sir Professor Victor Uwaifo, Chief Osadebe, Bobby Benson, Eddy Okonta, E. C. Arinze, Ebenezer Obey, Sir Waziri Oshiomha, Celeson Ukwu and Rex Jim Lawson, Akoh Momodu, etc. ; for our indigenous music, such as High Life, Akwete, Akpala, Ikenga, Odogu, Atilogu, etc. ; the form of government after Independence before the military coups that brought us backward before we finally entered a democratic system of government that we are in not, our child need to know these things. The youths do not know who were our journalists, authors and writers of international repute, such as Peter Pan, Cyprian Ekwensi, Peter Obe, and It is the greatest disservice to our children who need to know how the country got to where it is today with a view that they may know properly how to proceed from where we hand over to them. Our country will continue to exist only if our children are prepared enough to take over from where we left. 9.) Our current Flag of green and white colours is very weak; there is a need to change it, because the first visual symbol of a country is its Flag. A befitting Flag for our country must display energies, strength and passion. An African power house’s symbol, as we are, should have some colours that speak at a glance; such colours as Black, Red, Yellow, Blue and Green combined with the coluors of a rising Sun in a Flag should emit positive energies that represent our people and country properly. Our people before the coming of the Whiteman used to face the Sun in adoration or prayer because we had thought that the Sun as was and is to us was the source of human Lives. It is the reason the White man used to call us pagans and the worshippers of the Sun from where the name, Sunday was derived. It was in their protest asking why must their day of worshiping be fixed on the day of the worshippers of the Sun. Let our Flag depict and show forth our noble strength, wisdom and passion. 10.) Few of our people have known before now that Christmas was deliberately created in the 4th century (see DoBeDo Ministries) by those who have been afraid of our Faith and wealth, as a measure to obliterate our source of wisdom and strength before the coming of the Imperialists; our source of wisdom being our culture, traditions and customs, (read Alan K. Waltz, A Dictionary for United Methodists, 1991). Also, Sunday Law was created by Emperor Constantine in 321 AD and imposed it upon our Holy day which is today known as Sunday. (See Church and State, by Charles S. Longcare, 1927). The period leading to December 25 in each year was a time of great celebrations and adorations by the people in ancient Africa known then as Ake bu land, in relative time, Egypt or Ethiopia (read Yosef ben-Joehannan or James Breasted). It has been a period in which Avatars were born. Avatars are the great Illumined Minds or personalities and Deities who were born of Virgin, such as Buddha, Zoroaster, and Jesus of Nazareth, just to mention but these few. Igue Festival, celebrated every year from December 14 to 25, by the Ogisos, King of Benin in Edo land, Nigeria is the only known of such celebrations and adorations in ancient time that have survived the onslaught of European and western imperialism. What we are now asking our people to do is this: Let us regain ourselves; in other words, let us reconnect with our ancestors by reserving a week within this period in every year from now on, to celebrate our festivals in adoration to the Higher Powers of our Earth. From what I have grown up to know now is that religion is not more than an introspective and rational understanding of the inner workings of the universe. Let us therefore; proscribe from our country what has not actually and realistically helped us, foreign religions should be put in the cooler politically so we may have the chance to heal Africa and Africans. Omoh T. Ojior, Ph.D., FRC is a Professor of Political Science/Executive Director/CEO Onima Institute for Development USA, Inc.